PhD (Physics), MSc (Hons first class)(Astronomy), BSc (Maths and Physics). 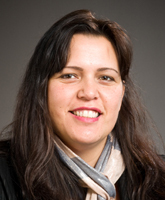 Dr Pauline Harris is from the tribes Rongomaiwahine and Ngāti Kahungunu. She has a PhD in astroparticle physics from Canterbury University, where she investigated gamma ray bursts as possible sites for high-energy neutrino production. Dr Harris is currently a research fellow at Victoria University of Wellington and is the Chairperson of the Society of Māori Astronomy Research and Traditions (SMART). There, she is dedicated to the collation and the revitalization of Māori astronomical star lore and the Maori Moon calendar aswell as the search for extra-solar planets and. Pauline has been involved in the revitalization of Māori star lore for the past 14 years, giving many talks pertaining to Māori Astronomy and Matariki/Puanga in New Zealand and overseas. Extra solar planet hunting using gravitational microlensing. Neutrino detection in the Antarctic ice. Marsden Project – Dr Harris is the Principle Investigator of the Marsden funded project called "Ngā Takahuringā ō te ao: The effect of climate change on traditional Māori calendars". A collaborative effort between the Society of Māori Astronomy Research and Traditions (SMART) and ʻohana from Hawaiʻi. MBIE Project - Insights into the Maramataka- As part of a MBIE funded project Dr Harris was been seconded to work for the organization SMART where she is working on a traditional Māori knowledge project around the Māori moon calendar. This project explores and develops new understandings of Māori traditional calendars. Contributing to the collation, preservation, revitalization of Mātauranga Māori pertaining to how Māori understood their environment, weather, agriculture, biology and astronomical knowledge pertaining to Māori traditional calendars. Marsden Project- Dr Harris is part of the Marsden funded project Te Mauria Whiritoi. TMW is a joint project with Waikato University and the University of Hawaii investigating Māori and Hawaiian Astronomy and will examine Māori beliefs, practices and observations in relation to astronomy, ecology and ritual . Te Ringihia nga kete nui a Tane – This project is an investigation into linguistic aspects of Māori astronomy. Pauline is part of the MOA collaboration, MOA-Microlensing Observation in Astrophysics. Gravitational microlensing is a technique used in the search for planets outside our solar system(extra solar planet). Previous to this she was part of the Radio Ice Cherenkov Experiment (RICE) group searching for neutrino’s using a telescope based at the South Pole. The Ministry of Business Innovation and Employment Placement scheme recipient.